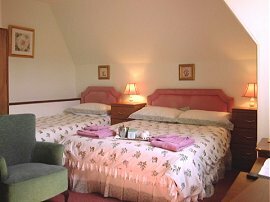 A warm and friendly welcome awaits you at the Kenvie Guest House, where your hosts Richard and Dorothy Vidler offer well-decorated bedrooms with comprehensive facilities. These include complimentary tea and coffee making provisions, colour TV, electric blankets, hair dryers and central heating. With all the right personal touches having been thought of, we are sure your stay will be very comfortable. This charming traditional Victorian townhouse is furnished to a high standard, with some antique and period pieces. We're situated on a quiet street in a mostly residential area on Edinburgh's south side. It's a convenient location for all routes into or out of the city. There is an excellent bus service with the bus stop is just a short block away. All directions to Edinburgh will cross the City Bypass (A720 ) on the edge of the city. When you see the signs for this road, follow them in the direction for Edinburgh South. You should then exit the Bypass at the Sheriffhall Roundabout, following the signs for the City Centre (A7 North) - also signposted Royal Infirmary and Old Town. After aprox. 6km (4 miles) you will find another roundabout, next to Cameron Toll shopping centre (a dark glass modern building with a red neon strip around it at night). Follow the roundabout under a railway bridge and take the next left onto Dalkieth Road, this is still the Old Town and A7. After 1/2 km (500 yards) you will pass a row of shops on your left. Opposite the last shop (a hairdresser), you should turn right into Kilmaurs Terrace, and you will find Kilmaurs Road at the top. Turn left and the Kenvie is on the left. Alternatively, if you miss Kilmaurs Terrace, continue a short distance to the traffic lights, turn right into Priestfield Road, and right again for Kilmaurs Road. Follow the signs for Princes Street, 2 minutes walk from either St Andrew's bus or Waverley train stations. Outside H & M store, there are 2 bus stops: take the 30 or 33 Lothian Bus (red buses) or 86 First Bus (green bus). Numbers can be found on the bus stop itself. The journey time is about 10 - 20 minutes and the fare is £1. Ask the driver to let you off 2 stops after the Commonwealth Swimming Pool. Walk the way the bus is going to the corner, turn left into Kilmaurs Terrace and at the top of the street, turn left into Kilmaurs Road. Kenvie is on the left. Alternatively, taxis are plentiful from either bus or train stations. Other bus numbers are 2 and 12 from Edinburgh Conference Centre, 14 from Leith (Royal Yacht Brittania) The City centre is about 10mins. by bus, and about a 20 - 25 min. walk. The bus stop is a short block away. There are buses between the airport and Waverley train station in the city centre every 15 minutes (#100). Takes 30 - 40 minutes depending on traffic. Once at the train station, use the city buses as described above or take a taxi. Taxi fare from the airport is about £18. From Waverley train station or St Andrews Square bus station it is about £6. If hiring a car use the city bypass A720 south and follow directions on how to find us by car above. Journey time is about 30 - 40 minutes. Winter rates are from £25 per person per night to £30 per person per night. Summer rates are from £28 per person per night to £40 per person per night. Listed in "Lonely Planet" "Rick Steves" and "Best Bed and Breakfast" guides.